Merry Hill is easy to find and is located near Brierley Hill Town Centre in the West Midlands. We’re just 5 miles from the M5 motorway and 12 miles to the west of Birmingham. Click here to visit the centre’s own website for detailed directions and information whether travelling by car or on public transport. 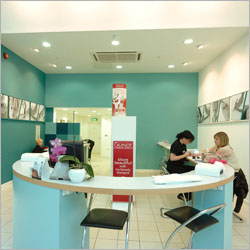 Within the centre we are located on the Upper Mall near to Toni and Guy’s hairdressers. Merry Hill has over 10,000 parking spaces conveniently close to the mall entrances. Open most Bank Holidays and has extended opening hours at some periods. *please be aware these are the salon’s general opening hours and are subject to some minor periodic and seasonal variations. If you are planning a visit close to the start or end times it is always advisable to check with the salon first.